I’m from Bruges (Belgium). You know, that famous medieval city in Belgium. 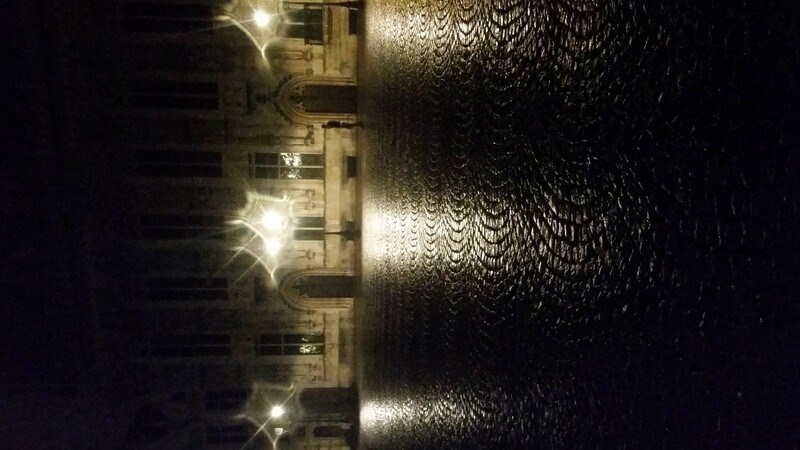 As everyone in Belgium knows, the center of Bruges is paved mostly in sett/cobblestones. Personally, I’m pretty fond of those sett pavements. They’re way nicer to see then asphalt (not to mention conrete plates), the absorb a lot of heat in the summer (cooling the city) which is released again in autumn. But, as the bicycle is my primary means of transportation, one drawback comes to mind: they’re uncomfortable to cycle on - especially when pulling a cart. Some types of set pavement are to be avoided then - I’d rather drive 200 meters over asphalt than 100 over the big boulder. However, the smaller sett -often laid in arcs- is more comfortable to drive on and has a smaller penalty. This implies that more information should be added to the ‘surface’-tag. In this document, I propose a few extra tags to deal with this extra information; and what kind of sett these are. These tags are used in Bruges; feel free to use them in other places as well. All example pictures are taken by me, and may be used freely for OSM-related endeavours (e.g. wiki, tools, …). First things first.. What is sett stone? And what are cobblestones? 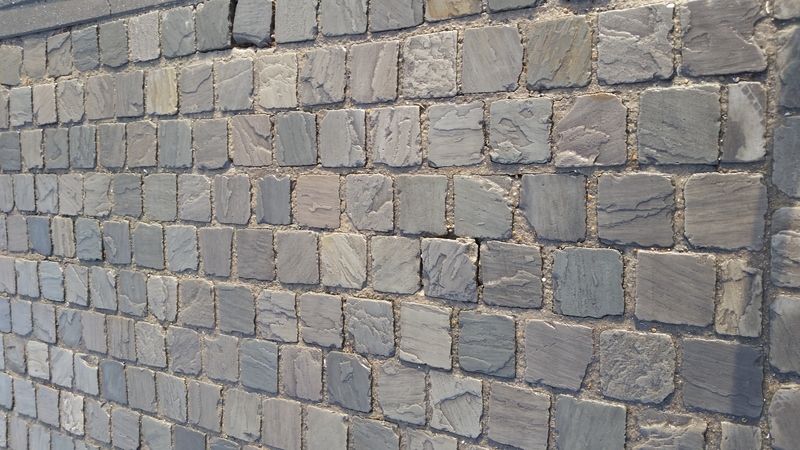 According to Wikipedia, Cobblestone is a natural building material based on cobble-sized stones, and is used for pavement roads, streets, and buildings. Sett is distinct from a cobblestone by being quarried or shaped to a regular form, whereas cobblestone is generally of a naturally occurring form. surface=sett: Sett surface is formed from stones quarried or worked to a regular shape. 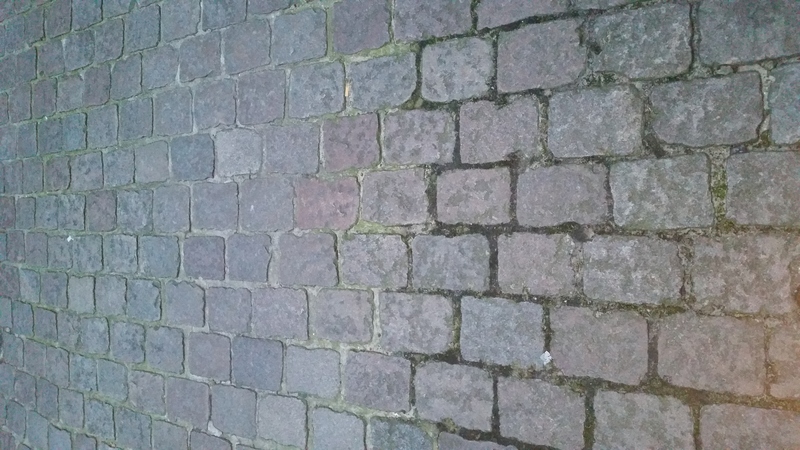 In OSM, this is a subset of “cobblestone”, and it is far more common to tag these surfaces with surface=cobblestone instead. (Used for around 52k ways). In other words, please, only use sett from now on; and use cobblestone only for when the natural form of the stones is still visible and thus results in a random pattern of laying the stones. 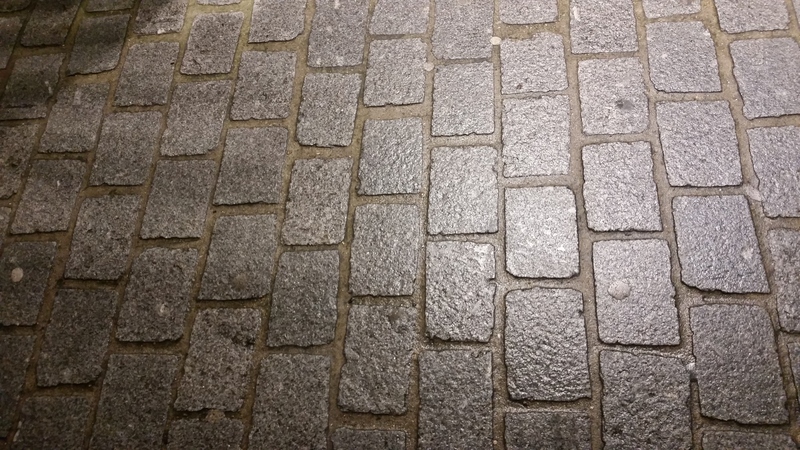 And then there is the even more attrocious surface=cobblestone:flattened; still in use for around 4k ways. The wiki says on this that this is neither a correct name, like sett (cobblestone is by definition not shaped into any form), nor a colloquially used name, like cobblestone. In other words, a tag that should not be used anymore and be translated to sett. As already discussed: cobblestone is somewhat chaotic in natura, as can be seen in this image (again, from Wikipedia). With these prerequisites out of the way, lets talk about the main topic of the post: sett in all its sizes and patterns. These can be laid down in various patterns, as described belowed. The first, and most common type of sett are the ‘big boulders’: the big, rectangular sett stones, in a interleaved pattern like a brick wall. As these are the most common stones, I didn’t bother to add more tagging to them. The second most common type of sett are small cubes, in a pattern of multiple, parallell arcs. Nice to see, and not to be confused with the very similar belgian fan. 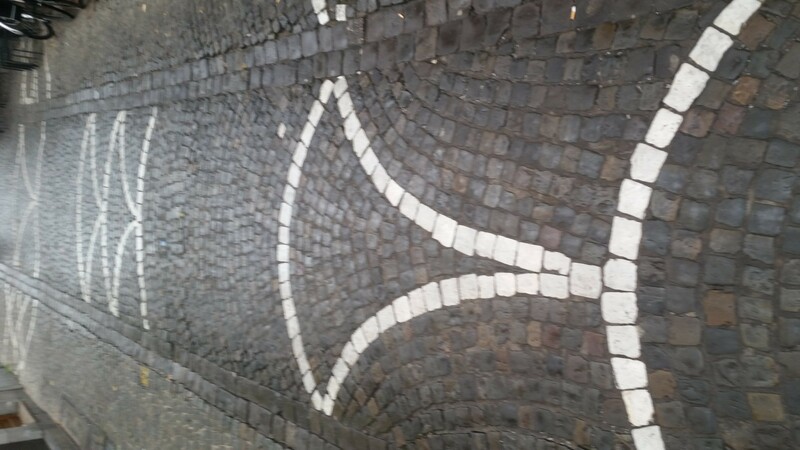 This is the only street in Bruges that still has this pattern! There used to be Belgian Fan in the streets around the Simon Steven-square as well; but a recent (~10 year ago) reconstruction of the site used ‘normal’ arcs, as visible above. The other place that still has a few specs of belgian fan is one construction site as well; so it is endangered as well. Perhaps someone should complain to Unesco that we are losing some world heritage! At last a word on paving_stones: the consensus here is that these are (in general) modern, mechanically shaped to neatly fit. The can be cast from concrete, they can be natural stones that are cut in a specific shape, … For example, I consider brick roads to be a subclass of paving stones (but I’d tag it as surface=brick anyway). As you’ve already noticed in my previous posts, I’ve customized the routing parameters for OSMand to help with this task. 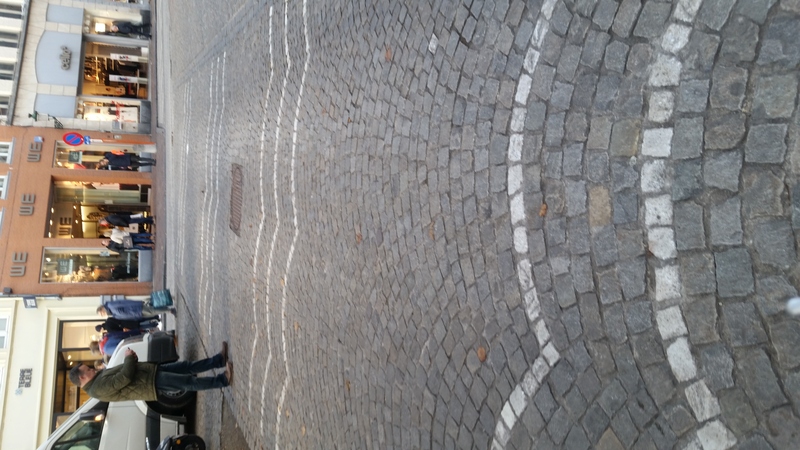 It also was an excellent reason to map all the street pavements of Bruges. It was a lot of fun to do, and it helped to discover new places in Bruges; both beautiful or ugly. The result of all this mapping can be visualized, thanks to overpass-turbo. Maybe the distinction between sett types that are good or bad to ride on with a city bike can be done by applying the smoothness tag. I have to re-read the thread to remember whether there was any consensus. Smoothness can be somewhat subjective. Smoothness ‘good’ might mean that it’s good to drive with a mountainbike, but not rollerskates. That’s why I decided map the very measurable patterns. And although I prefer the term sett over cobblestone, using cobblestone is still better than no information at allL. “the consensus here is that these are (in general) modern, mechanically shaped to neatly fit. The can be cast from concrete, they can be natural stones that are cut in a specific shape,” Some remarks, since its hard to determine what kind of paving stones there have been used to pave a road by 9 out of 10 mappers fail to do so, consensus based on ? Most mappers are or will be able to see if its natural stone (cobblestone), concrete (also known as BKK) or a -baked clay model, but there are several kinds of clay-bricks. And do not ask an Italian what kind it is of or even a lowlander. The most used are called from small to big, IJssel bricks, Waaltjes and Fat-stone but almost every brick bakery had its own format (size). So, adding that kind of info here and there would not make a sturdy database. And yes, all of the mentioned pavements are ‘set’ brick by brick, if that’s the definition of sett, because they are applied in a certain kind of pattern (several). Consensus is mostly based on what I read on the wiki and wikipedia. Most mappers indeed don’t know all these different kinds of paving stone. For those, I would propose to add a tag “paving_stone:type” or something similar. This way, the ‘surface=paving_stones’ still makes a sturdy database. As I’m not an expert on paving_stones, I’d love a diary which explains the differences as well! This has actually led me to quite an interesting forum thread. And much delayed: I was using smoothness according to OSM definition. But I agree that tag’s name and values are quite vague (and it would be much better if they weren’t). 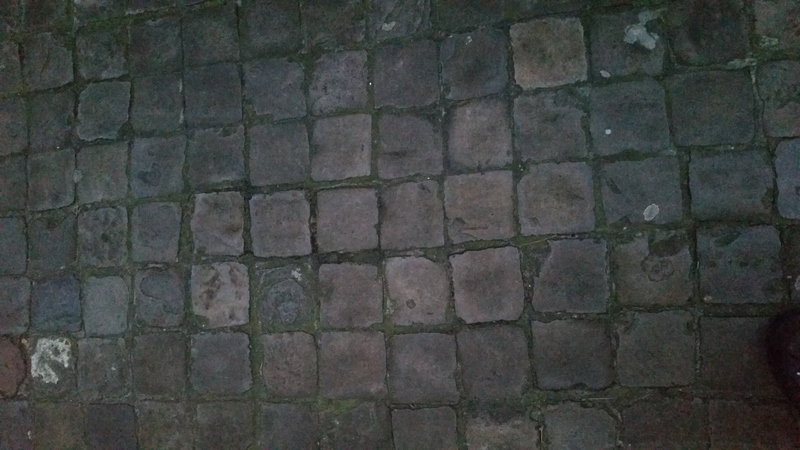 I would suggest that, instead of defining sett:pattern, it should be a broader tag such as paving_pattern=coursed/stacked/basketweave/herringbone/tudor/dutch/random/europeanfan/bogen/guilloche/mosaic/crazy/…, so that it can be used with paving_stones, cobblestone, and even grass_paver. Even concrete:plates could then be merged with concrete and the layout style moved to paving_pattern=plates. paving_pattern=* would indeed be better. However, then I’m still missing something to declare the type/size of the stone (e.g. square:50 instead of paving_stones:50, rectangular, …) It would also make the ‘top level’ -tag easier to use, as it has less options. Thanks for bringing this proposal into my attention. I’ve chimed in as well.